The Reflection Group “Cultural Heritage and the EU”, composed of national heritage authorities from a number of EU Member States met on 26-27 March 2019 in Paris, together with observers from the European Commission, the Committee of the Regions, the Council of Europe, UNESCO and ICOMOS, as well as a number of civil society organisations including Europa Nostra, ENCATC, European Council of Spatial Planners, European Historic Houses Association and Future for Religious Heritage, all members of the European Alliance 3.3. The Group discussed the latest developments on cultural heritage projects and policies in Europe, with a particular focus on the aftermath of the European Year of Cultural Heritage 2018 and the way forward. 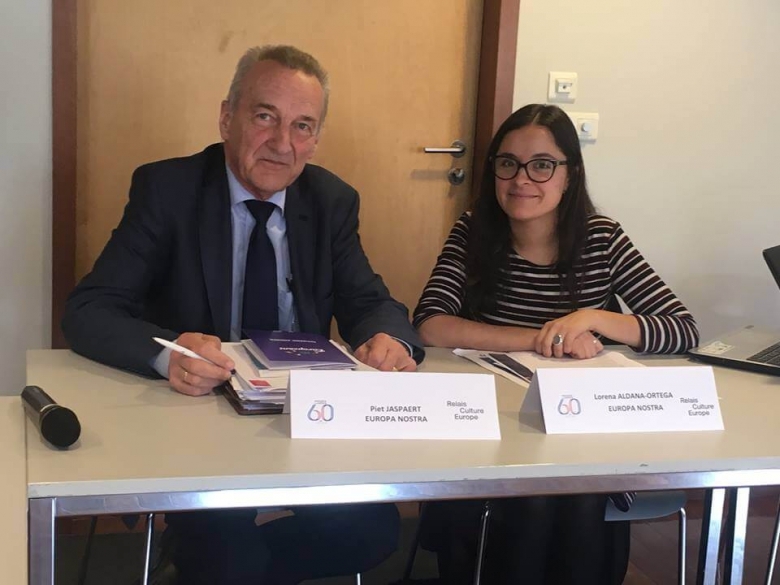 Europa Nostra has been an observer in this group for the past five years, and this time was represented by Vice-President Piet Jaspaert and Outreach Officer Lorena Aldana. Europa Nostra was invited to present its latest activities, in particular the follow-up to the Berlin Call to Action “Cultural Heritage for the Future of Europe” as well as key upcoming events and policy positions. The meeting was hosted by the National Institute of Cultural Heritage (Institut national du patrimoine), whose Educational and Training Programme for Conservators received a European Heritage Award / Europa Nostra Award in 2018 in the category Education, Training and Awareness-Raising. The Reflection Group discussed among others the outcomes of the European Year of Cultural Heritage 2018 with a focus on its legacy, in particular the European Framework for Action on Cultural Heritage published by the European Commission in December 2018 as a follow-up to the European Year, and the upcoming European Heritage Forum, an Informal Expert Group that will be established by the Commission to monitor the implementation of this Framework. Representatives from the European Commission, the Committee of the Regions, the Council of Europe and the UNESCO updated the group on the latest heritage developments and perspectives for the future within their respective institutions. Representatives from civil society organisations followed, presenting the main results of the work carried throughout 2018, as well as their upcoming projects and events. Europa Nostra’s Vice-President Piet Jaspaert took the floor to present the outcomes of the Berlin Call to Action, signed to this date by over 2,200 individuals and organisations. In addition, he explained how the Berlin Call to Action has inspired other actors to draft similar documents in response, for example the ViMM Manifesto for Digital Cultural Heritage prepared by the Virtual Multimodal Museum, an EU- funded initiative bringing together organisations working on virtual museums and in the wider sector of digital heritage. This is an excellent development as it shows the relevance of the Berlin Call to Action, and its use and appropriation by stakeholders in the field. Piet Jaspaert also presented Europa Nostra’s position paper on heritage-related research, a document discussed and approved by the Europa Nostra Board at its meeting held on 26 March 2019 in Vienna. The position paper, which will be published shortly, reflects the views and expectations of Europa Nostra with regards to EU-funded research in the heritage field, in light of the upcoming Horizon Europe programme for research and innovation (2021 to 2027). This position paper will serve as an advocacy tool to influence policies in this area. With regards to future action, Europa Nostra’s Vice-President raised several important points, including the need to take into account the digital dimension of cultural heritage, how to bring to life the different policy documents that are now available but not always used in practice and how to reach out to the younger generations, among others. ✅Many policy documents exist… how to make them LIVE? During the concluding session, Piet Jaspaert congratulated the Reflection Group for having established a ‘real trialogue between European institutions, national governments and civil society organisations, each actor respecting others’ competences and autonomy, and working together for a common interest’. Europa Nostra also seized the opportunity to invite participants to continue supporting and facilitating bottom-up initiatives for the benefit of Europe’s cultural heritage. The Reflection Group meeting was an excellent opportunity to further strengthen the dialogue between governmental and civil society bodies active in the field of cultural heritage. The next meeting of the Group will take place on 2 October 2019 in Finland, under the Finnish Presidency of the Council of the EU. The Reflection Group gathers cultural heritage experts appointed by national heritage authorities in an informal network that aims at contributing to and co-ordinating cultural heritage policy in Europe. The Declaration of Bruges (pdf) at the end of the Belgian EU-Presidency (9th of December 2010) was the starting point of this Group.